Managing partner of Top Third Ag Marketing, Mark Gold, was the keynote speaker at the Hillsboro Chamber of Commerce’s Ag Is Everyone’s Business seminar, held Friday at Southern State Community College’s Patriot Center. 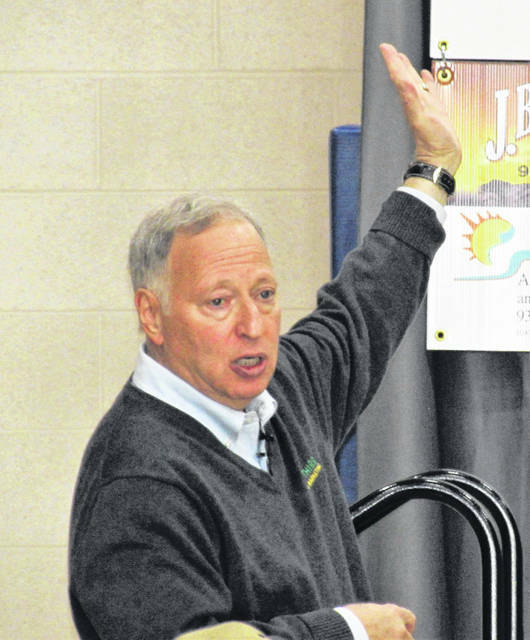 The keynote speaker at the annual Ag is Everyone’s Business event told a crowd of nearly 300 people that he wants farmers to be risk managers and not speculators. The Ag is Everyone’s Business breakfast, held Friday morning at Southern State Community College’s Patriot Center, is now in its seventh year. The event is coordinated by the Highland County Chamber of Commerce. Gold said the old adage “you have to spend money to make money” was never more true for farmers, advising them that there is a cost in doing anything and that buying a commodity option is a great way at protecting downside risk. A “put option” could be employed as an insurance policy, he added. In his booklet “Marketing in the Top Third,” Gold described a “put option” as one that gives the buyer the right, but not the obligation, to sell, or “go short,” on the underlying futures contract at the strike price on or before the expiration date of the option. With the focus of the event being on the business side of agriculture, State Representative Shane Wilkin said farming is the biggest business in the state, and that many of his colleagues in Columbus have a connection to the family farm. He said the transportation budget will be unveiled in March and with that, he knows of several roads in the 91st House District that are heavily damaged due to recent flooding. That could prevent farmers from getting in and out of their fields this season, Wilkin said. “If you can’t get your crops to market, everything discussed here today doesn’t matter,” he said. Gold’s contention was that every farmer needs to be more of a marketer, something that Highland County Commissioner Jeff Duncan, who farms in the Leesburg area, agreed with. “It’s easier to produce it than it is to sell it,” Duncan said. Gold asserted that most farmers wind up selling their commodity in the bottom third of prices, because they don’t sell or price their product in a timely manner. 2. Combine effective crop insurance with the marketing plan. 3. Use options to manage risk, such as buying put options to protect unsold product and to buy call options to replace grain or livestock already sold. 4. Do not be a speculator. He said one of the problems facing both the small farm operations in the 21st century stem from the temptation for smaller farmers to sell out, especially if there are no children interested in continuing the family farm. Highland County Commissioner Terry Britton has a small hay operation outside of Hillsboro, and understands the importance of the small family farm. At the close of the agri-business seminar, an auction was held for the sale of two pedal tractors and a grain cart. Helping with the logistics of the event was Jordan Williamson of the Berrysville area, who is a member of the Hillsboro FFA, and whose chapter shared in the benefits from the pedal tractor auction. Proceeds from the auction are earmarked for the FFA chapters in the five Highland County public school districts. She said she is currently taking classes at Southern State Community College and plans to transfer to Shawnee State University. The first tractor in the auction was a Case IH Farmall 656 pedal tractor with a grain cart, which is also a Case IH Farmall and matches the tractor. Both were donated by Bane-Welker Equipment in Wilmington. The second tractor was a John Deere 720 pedal tractor donated by Five Points Implement Company in Hillsboro.